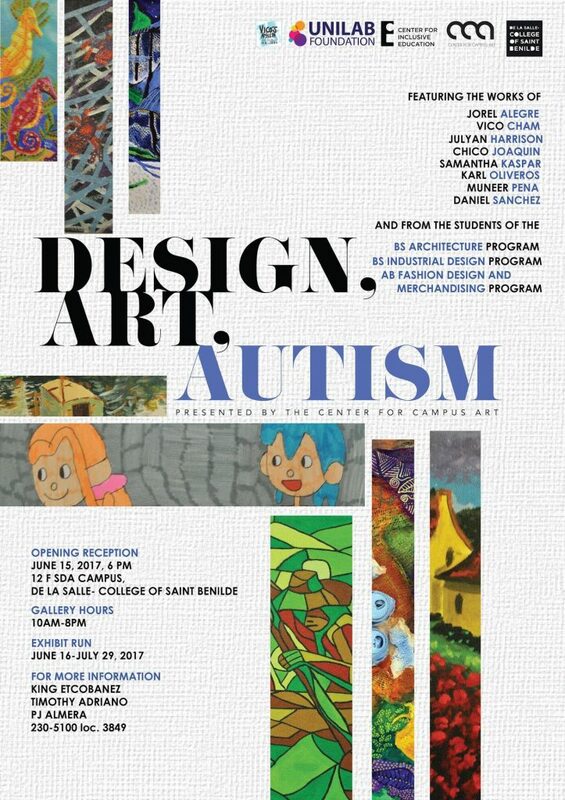 Eight aspiring artists with autism created artworks that were interpreted by design students of De La Salle-College of Saint Benilde. These artworks are currently on display at the Design, Art, Autism exhibit located at the 12th floor of the School of Design and Arts (SDA) Building until July 29 from 10AM-8PM. In partnership with Vico’s Artism Gallery, this is produced by Unilab Foundation (ULF), the De La Salle – College of Saint Benilde’s Center for Inclusive Education (CIE) and the Center for Campus Art (CCA). The campus let the students work on these artworks as their response to the formers vision of having an exhibit of the works of the artists in their roster of Persons with Autism (PWA). 1 Autism in focus. As presented in the text and videos during the exhibit, the project discusses the basic information and the latest developments on the special condition as well as the vital role and practice of art therapy for people with such special case. 2 New talents to discover. Karl Oliveros, Vico Cham, Jorel Alegre, Daniel Sanchez, Samantha Kaspar, Muneer Pena, Chico Joaquin and Julyan Harrison proved that having a condition is not a hindrance to make the world witness their talent. 3 Inspiration to reinterpretation. Based on the foundation artists’ paintings, CSB students had their own take and turned them into actual art pieces—toys, furniture, jewelry, garments, among others. “As the Curator, I believe that the collaboration between art and design can lead to innovative results. My inspiration is the creativity of the Benildeans,” said Center for Campus Art Director Gerry Torres. Aiming to foster awareness, understanding and acceptance of people with autism, this project looks forward for the people’s change of perception towards autism. For more information about the exhibit, you may reach King Etcobanez, Timothy Adriano or PJ Almera at 230-5100 local 3849.